ThyssenKrupp has announced it's selling its Brazilian steel mill, ending its loss-making Steel Americas adventure. The German industry giant has long sought to move away from steel and shift to industrial goods. German heavy industry behemoth ThyssenKrupp reported Wednesday it had agreed to sell its Brazilian CSA steel mill to the Ternium Group headquartered in Argentina. Ternium looked willing to pay 1.5 billion euros ($1.6 billion) for the deal, which would put an end to ThyssenKrupp's Steel Americas operations. The company had for years been trying to rid itself of the troubled Brazilian mill after already ditching its other steel plant in the Americas, the unprofitable Alabama steelworks. "With the sale of CSA, we're parting fully with Steel Americas, and this is an important milestone in the transformation of ThyssenKrupp," CEO Heinrich Hiesinger said in a statement. 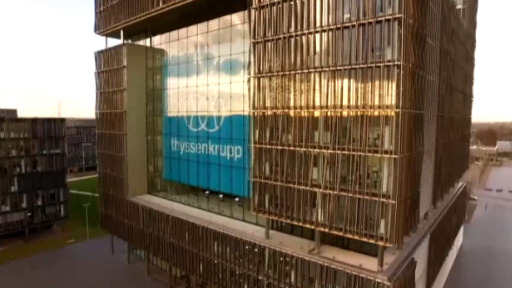 Taking into account the proceeds from the Brazilian sale, ThyssenKrupp said the net loss from the ill-fated attempt to expand its steel activities into the Americas still stood at around 8 billion euros. The firm is now focusing on making industrial goods such as elevators, car parts and submarines. Earlier this month, the group announced it had swung back to profit in the first fiscal quarter, mainly thanks to a boost in elevator sales. It is one of the most radical shake-ups at a big German company in decades; the steel and industrial giant will now split into two seperate companies in a bit to return to profitablity.